Posted: July 24th, 2011 under Opinion, Review. For a game where parasitic zombie people are trying to take over the world through a cooperate conglomerate, it felt real. You are for the most part a regular guy on a rescue mission that loses communication with his handler. Soon you find out that you have been contaminated by the parasites and have to press forward in the game to where the evildoers store the cure. Eventually you do reach a point where you reestablish communication and the cavalry arrives; but only to quickly get taken out, and it is coupled with a rather dramatic reveal of the final boss. Some other nice realism details is that enemies are not completely mindless, if your laser sight shines in their face for too long they will try to dodge or cover their eyes with their hands. They also alert other enemies to your presence, employ group strategies, if you barricade a door they have the intelligence to find other ways into buildings, and they are able to use tools and operate machines. A Ganados is a fairly capable foe, enough to surprise you and catch you off guard if you are not careful. Limited resources are what really defined this title. You have to take the time to make head shots, otherwise you are going to run out of munitions (you are given a knife as backup for a reason). You start the game with just a basic handgun and 30 rounds and immediately feel the pressure to take out enemies efficiently. There isn’t a bunch of health in the game either, so the limited resources add tension to every encounter, pressuring you to make a shot before the enemy gets too close. The overall pacing of the game is excellent as well; typically the game flow will get you in over your head before rewarding you with a new weapon. An example is the first time you visit the infamous ‘village’, where you need to take out a large crowd of people still with just a handgun. Once the horde is dispatched and you start rummaging for resources you find the shotgun – a great transition from being overwhelmed to feeling powerful. Furthermore, since you just pushed your current weapon to its limits and things got a little dicey, you already learned the threshold for when you want to alternate your zombie dispatching strategy. No matter what you interacted with, there were always surprises and challenges; even the mechanic for opening crates, boxes, and jars added suspense to rudimentary search and salvage. Every once and a while you would disturb snakes resting in these vessels and need to add an additional knife slash before they bite you. Although you couldn’t just wildly wield the knife in these moments either because you risk destroying some types of collectibles that you need. Even when you do well in the game, it stays interesting because your inventory is capped. There are moments where you can sell extra resources and purchase upgrades, but you can’t buy ammo or grenades. I am sure these might sound like frustrations, but it really added weight to your looting decisions and planning for your next few encounters. This storage shortage made you evaluate every resource thoroughly, and while every weapon had its uses, trying to carry them all would severely limit the amount of ammo you could carry. For instance, the game has a rocket launcher which is great for a one shot kill on some of the bosses but takes up a massive 16 inventory slots, the equivalent of 8 boxes of rounds. There are also stock attachments that you can purchase which will steady the recoil of some weapons but can be painful storage price to pay. These mechanics kept even the good players from having an overabundance of resources, maintaining the tension in combat throughout the game. Is it really dead, or is this thing going to get back up and try to kill me? Funny thing about parasites, sometimes they will sprout a second head after you blow the first one clean off; and if not, sometimes they can still survive long enough to grab onto you. It just adds to the challenge of making head shots at a distance, as well as messing with your target priority. 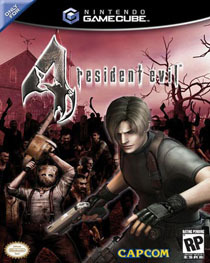 The other epic design, although this is prevalent in every resident evil game, are plenty of one hit KOs. Even if you are at full life and are packing plenty of heat there are still plenty of ways to screw up so that you never really feel completely safe and you are always on your toes. Often in these scenarios you are prompted with on screen reflex controls to press, so even your hands on the controller are never completely relaxed. So why is interacting in this world where everything is trying to kill you fun? Admittedly, it might not be fun for everyone; some might not appreciate the challenge or gore. At some base level it has some of the same appeal as experiencing a horror movie, the fear – death = fun equation. More than that though you are limited enough on bullets that every time you fire your weapon you are making a conscious and interesting decision. Can I take down this group of enemies with my handgun or do I want to play it safe and use some shotgun rounds or spend that grenade that I have been saving? Do I want to try and carefully walk through these booby traps or spend a few rounds to set them off from a safe distance? I knocked down a chainsaw wielding Ganados should risk I moving in and try to knife him to save ammo, or stand back and let him get back up for another charge so I can make a clean head shot? As Sid Meiers once said, good games are made from a series of interesting decisions. The Resident Evil 4 world is constantly surprising you with new enemies, events, and locations. There is also plenty of spice with puzzles, bosses, protecting Ashley (the President’s daughter who you have to save), and interactive cinematic sequences (yup, you can’t even relax in the cut scenes). I would describe it as maintaining a very high level of engagement. It is easy to kill Ganados with enough ammo, it is tough to master killing them with a single shot, even tougher to take down a big group with one shot each. The tension combined with how they mix up the environment means there never is a dull moment, there is always some challenge even when you are just shredding boxes for loot. Even after you have played this game several times there are still moments where you say to yourself I can do better or I wonder how that would have played out if I had confronted that encounter differently. And to be honest, meeting up with a regenerator still gets my heart pumping (it is still the creepiest game experience I have had). Tension, interesting decisions, risk and reward, challenge, a world that feels believable and reactive, and a game mechanic that is easy to learn yet hard to master are elements of any successful, enjoyable, and ultimately fun experience.